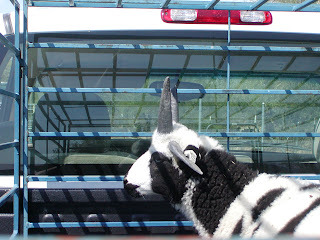 Marc and I drove to the Prescott area today to pick up Frodo, my new Jacob ram. Bill has lovely sheep, but a much smaller operation than I do. The pick up took about 10 minutes. Three hours there and three back.. Thank God, the weather stayed nice and the traffic was relatively light going through Phoenix. Frodo has four horns and is black and white. My current Jacobs are lilac and chocolate. Since Garnet had a ewe lamb this year, I had to invest in a new ram. Otherwise, I would have just bred her son back to her. 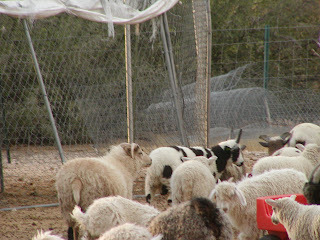 When we first got back, I put Frodo in a pen by himself near the sheep. 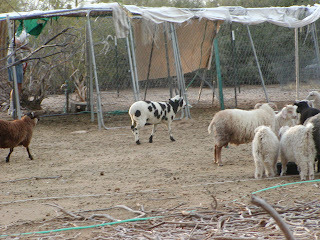 He was still fussing three hours later, so we let him out.He instantly moved to the sheep hangout and hooked up with the other Jacobs. Since all of the sheep breeds are out together, it tells me that sheep know their own breed and have their own language. 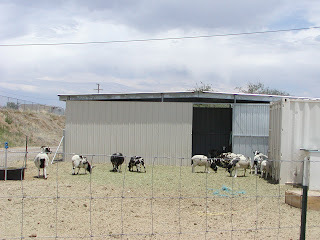 I knew this about the angora goats and the dairy goats, so i was not surprised. Frodo is already a part of the herd within minutes.